When it comes to having a baby, there's no way to get around diapers. Whether you choose to use cloth, disposable or a combination of the two, at some point all moms will use disposable diapers on their baby. 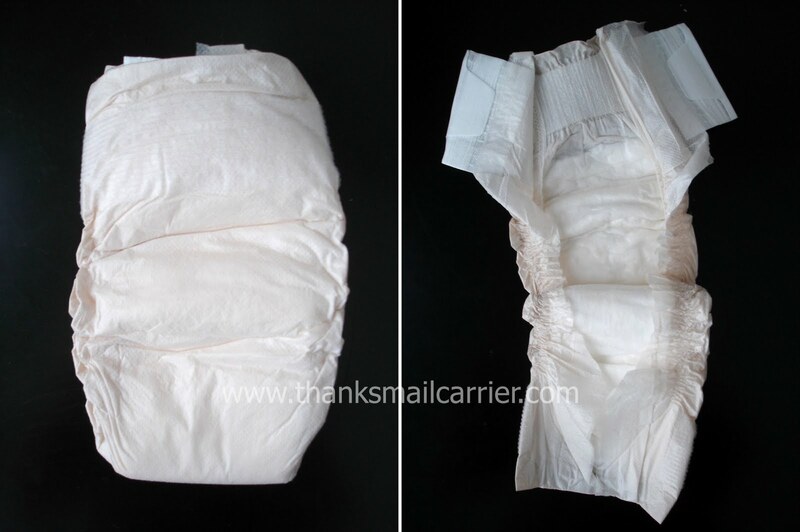 Whereas cloth diapers have transformed and improved over the years, disposable diapers have mostly stayed the same. They're still fast and easy to use, but the statistics on their impact on the environment haven't really changed, not to mention the chemicals that are in them that rest against a baby's sensitive skin. We all want to do what's best for our children and our world, so fortunately there are companies that allow us to make choices that can benefit them both. 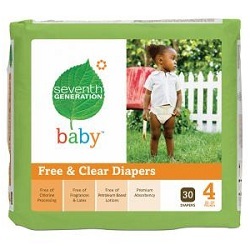 And, when it comes to diapers, that's what Seventh Generation does with their Free & Clear Diapers. Newly relaunched, Seventh Generation Free & Clear diapers have the same great performance that parents demand from diapers but without all of the unnecessary extras. By not including chlorine processing, fragrances, latex and petroleum-based lotions, you can rest assured that your little one's delicate skin will always be protected. When it comes to the earth, Seventh Generation has that protected as well. In an effort to contribute less overall landfill waste and continue to ensure a premium standard of absorbency, the new Free & Clear diapers have been redesigned with a lighter-weight core. Plus, by using processed chlorine-free wood pulp in their Free & Clear diapers, Seventh Generation also makes certain that no chlorine is released into the environment during the totally chlorine-free (TCF) whitening process of the diapers and training pants. If that all wasn't enough, Seventh Generation has also reduced the size of the diapers' plastic packaging, meaning that each pack now contributes even less overall landfill waste than before. In fact, Seventh Generation Free & Clear diaper packaging can now be recycled at local supermarkets where plastic bag recycling collection boxes are available. How cool is that? As we began trying out these eco-friendly diapers, I immediately felt as though they were high quality, well-made and durable enough to stop leaks. After thoroughly testing these diapers out, Seventh Generation Free & Clear passed inspection perfectly. They proved to be extremely absorbent and the fit was just right to allow Little Sister B to be as active as she is without ever having even the tiniest of leaks. Overall, I was very happy with these diapers not only on their performance but on how they treated Little Sister B's skin. It felt as baby-soft as ever! I love the idea that something so good for my daughter's well-being can also be so eco-friendly and beneficial for the earth. Seventh Generation really has thought through all of the aspects of these great diapers! To enter to win: Tell me what impression you have of the new Free & Clear diapers OR what you love about eco-conscious baby products. 1 Extra Entry (per method) if you follow Seventh Generation on Twitter and/or Like them on Facebook. A big thank you to Seventh Generation for providing diapers through MyBlogSpark for me to review as well as for one lucky giveaway winner. The opinions shared are my own and honest and if you really need to see more, click here to see how I roll. I like that they're chlorine-free, so they're safe for baby & the environment! like 7th generation on FB: becca p.
These look wonderful--all the convenience of disposable diapers, but oh so much less environmental impact than traditional diapers. I love the hypoallergenic nature because our family has irritated skin a lot! And, I love the idea of being green conscious. I love that they are chlorine free and better for the environment. I like them b/c they are chlorine free. i love that they are biodegradeable, disposable diapers are really hard on the environment!!! I love eco conscious baby products because we can care for our little one while knowing we are protecting the environment. Follow 7th generation on twitter. Entered the high chair giveaway. My baby has SUPER sensitive skin...he just can't use any of the mainstream brands. Chlorine free diapers are the ONLY way to go for him! Now that I've seen how the chemicals in the other brands react to his skin, any future children I have will use chlorine-free or cloth ONLY! I like seventh generation on facebook! 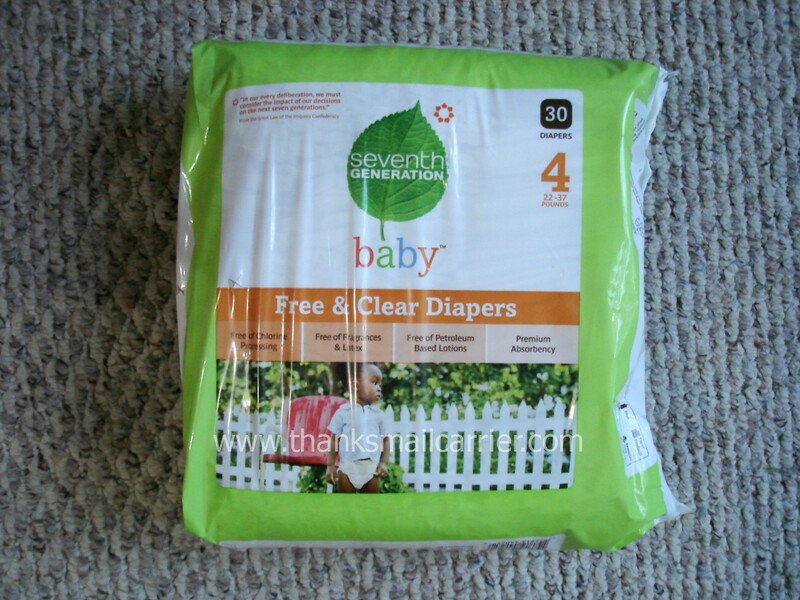 I love the Seventh Generation diapers, and I love that the free and clear has no chlorine and harmful dyes. I'm always looking for the best for my baby and this looks pretty good. i luv how great they sound for sensitive skin! love that they are chemical free! I love the idea of irritant free anything, especially for kids. I like using cloth diapers because I dislike putting harsh chemicals on my little guy; these would help for when we travel and can't use cloth. I have a very positive impression of the new Free & Clear diapers - I love that they're environmentally friendly but easier to use than cloth diapers - which can be a lot of work! I like that they are chemical free! I’m entered to win the JcPenney’s $50 GC giveaway! I’m entered to win the Wooden animal toy giveaway! I’m entered to win the Rubbermaid giveaway! I’m entered to win the Brookstone giveaway! I like that they are chlorine free. I love that they are chlorine free which makes it safe for baby! I haven't used their diapers but I have used other Seventh Generation products. I think that the diapers would be high quality and soft. I entered the Energizer VH1 Save the Music giveaway. I entered the Pampers Cruisers giveaway.